The actor Ichikawa Aragorô I held this name from the 11th lunar month of 1798 to the 11th lunar month of 1813. Dates of birth and death unknown. Disciple of Ichikawa Danzô V, he started his career in Kyôto in the 11th lunar month of 1818 at the Kitagawa no Shibai, where he received the name of Ichikawa Kôzô and performed as a koyaku. He became tachiyaku and took the name of Ichikawa Emizô around 1832. 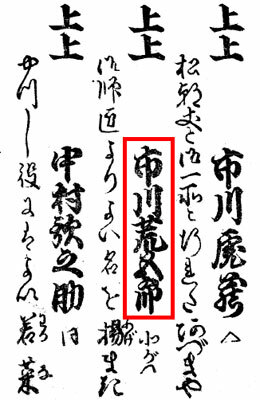 He finally took the name of Ichikawa Aragorô II in the 11th lunar month of 1841 in Kyôto at the Kitagawa no Shibai. His rank in the 1842 Kyôto hyôbanki, tachiyaku section, was jô-jô (superior - superior). No record afterwards. Dates of birth and death unknown. Relationship to the Ichikawa clan unknown. 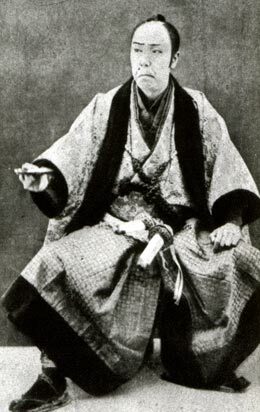 His Yagô being Mikawaya, he was most likely a disciple of an actor, who was related to the Ichikawa Danzô line of actors (Ichikawa Danzô VI?). 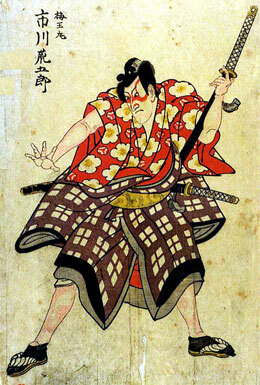 His first stage name was Ichikawa Senzô. He took the name of Ichikawa Aragorô in 1868 but he was never acknowledged as an official holder of the name. No record afterwards. Born in 1833. Disciple of Ichikawa Danzô V, he started his career in 1840 and his first stage name was Ichikawa Danjirô II. He performed in miyaji shibai. He stopped acting after the death of his master. He received the patronage of the wife of the owner of the Chikugo no Shibai and was back to the Kabuki world and took the name of Ichikawa Aragorô III in Ôsaka around 1866. He went to Edo in the 2nd lunar month of 1867, performing at the Nakamuraza in the new year drama "Gohiiki Soga Ichiza no Sakigake". He went back to Ôsaka and played in the 8th lunar month of 1872 at the Chikugo no Shibai the role of Tôma Saburôemon in the drama "Katakiuchi Tengajaya-mura". He died the 24th of February 1906. He was the father of Ichikawa Aragorô IV and the grandfather of both Ichikawa Aratarô II and Ichikawa Aratarô III. There will be in the future to come a full page dedicated to Ichikawa Aragorô III in kabuki21.com. The actor Ichikawa Aragorô IV held this name from September 1906 to May 1930. Born in 1970. He graduated from the Actors Training Center of the National Theatre (13th graduation) and made his debut on stage in April 1996 at the Kabukiza. He became a disciple of Ichikawa Danzô IX in March 1999 and received the name of Ichikawa Shigenosuke in April 1999 at the National Theatre, performing in the drama "Izayoi Seishin". He passed the nadai exam in September 2012 and officially became nadai in May 2014 at the Kabukiza, where he took the name of Ichikawa Aragorô V (a name not holden for 84 years! ).